French chef extraordinaire, Eric Ripert, once said, “Having sharp, great knives will enable you to cook very precisely.” But having and using sharp knives also presents a risk of injury, especially if your grip isn’t what it used to be. Our Best Knife Guards for Elderly 2018 review will help you find the right product for you so you can continue cooking as you always have without the added risk of injury. What Are Common Causes of Knife Injuries? How Can I Prevent Getting Hurt in the Kitchen? The set is a wise investment if you have expensive knives that need to be protected from wear. They protect the knives from dings if you store them in your kitchen drawer with other utensils. They help your knives keep their edge longer and reduce the need for frequent sharpening. They’ll last for the long haul. They won’t work out if you have odd-shaped or overly large knives. Won’t prevent injury while knives are in use. The EVERPRIDE Chef Knife Guard Set provides a way to protect both you and your knives. 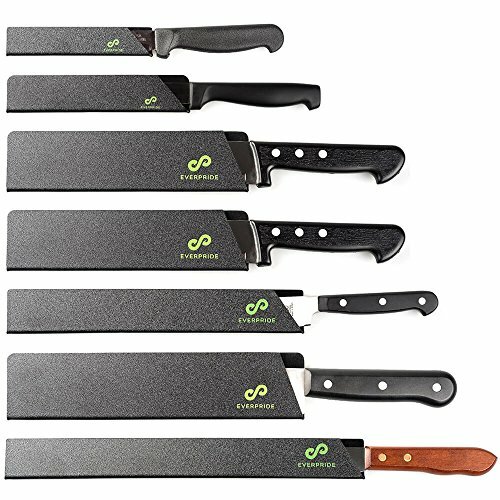 The slip-on plastic sleeves include a range of seven sizes to fit most knives and kitchen tools. If you don’t have a knife block, this is a great purchase to keep your knives protected from dirt or nicks they could get in a drawer. Furthermore, using the plastic covers will also keep you safe while they’re out of use. Otherwise, it could be dangerous to have sharp knives laying in a drawer where you can get easily cut or scratched as you’re trying to find something else. A great purchase to add an extra level of safety while you’re cooking. They are lightweight and comfortable. They have a snug fit to reduce slippage. They are more durable than leather. You have to wash it often between uses to prevent the transfer of bacteria or pathogens. You need to use both gloves separately, one for produce and the other for meat and seafood. The NoCry Cut Resistant Gloves offer a practical solution to a couple common cooking problems. Cuts are one thing, but it’s also essential to clean each side of your blade when cutting up fruits and vegetables. 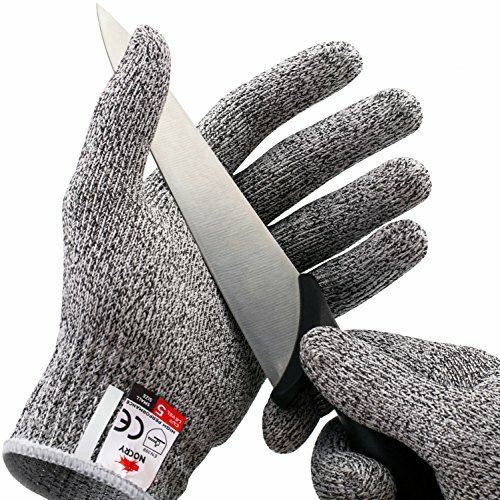 With this glove, it allows you to wipe off your knife safely without risk of an accidental cut. While you’re wearing the glove on the hand holding on to what you’re cutting, it’ll also keep you safe from accidental cuts and nicks. They have EN388 Level 5 cut-resistance which provides added assurance about their safety. This is a great product for seniors who may have slightly shaky hands. Even if your hand slips, the glove provides security in that you won’t cause a bad accident in the kitchen. It is adjustable to fit your finger size. It strikes a welcome balance between control and the ability to handle the foods you’re cutting. It’ll make things safer in the kitchen since it’ll slow your cutting pace. The Zelta Finger Guard is a simple yet effective way to protect your fingers. 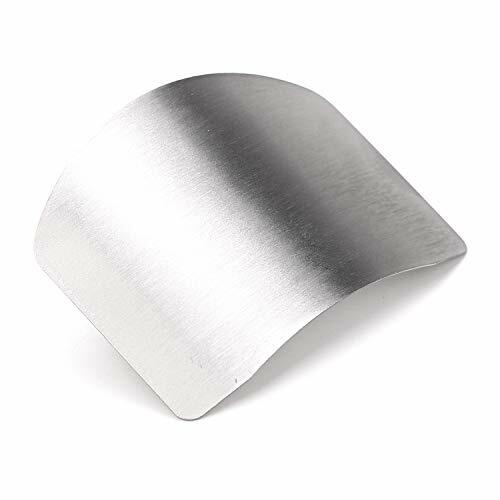 The stainless steel piece features an open ring on the underside into which you can slide your finger to hold it in place. It is a bit clumsy to use at first until you get used to it, but the steel is thick enough to protect you while still allowing you to work freely. Because the design still requires a certain level of dexterity so you’re able to keep it in place, we recommend this product for seniors who just need an extra level of safety in the kitchen, but may not be struggling with shaky hands or another mobility condition. While bulky, it will protect your hands from cuts. FOR NOVICE AND HOME CHEFS: An invaluable tool for the novice and for the home chef. PREMIUM QUALITY: Made out of high quality food safe silicone for long term durability. It protects both of your hands at the same time. It holds foods securely in place. It helps you slice foods evenly. It takes some time to get used to because of its bulky size. The Urban Trend Finger Armor Cutting Guard is another method of putting a barrier between you and your knife’s edge with the added benefit of keeping foods steady in your hand. The silicone sleeves protect both your hand and the knife while holding what you’re cutting securely in place and allowing your hand to be out of range of the knife. It works well with larger foodstuffs but isn’t as useful for smaller items. However, the manufacturer stands behind its product with a five-year guarantee. We feel this is the best option for seniors who needed added safety in the kitchen as well as added stability while they’re cutting. Whether you have shaky hands, arthritis or a mobility condition, this simple device will make cooking much easier and more pleasant. Knife guards in their various forms offer an excellent way to keep you safe so that you can focus on the task at hand. If one doesn’t work, you have plenty of other choices. The reasons for these accidents are as numerous as the people who incur them. Some accidents rest with the individual and their technique or awareness. They may turn away at a crucial moment with an unpleasant result. There are also problems that can occur with the products you’re using. Water on the cutting board creates a slick surface for both the objects you’re cutting and the knife. That’s why it’s essential to stabilize the foods before you start chopping and dicing. It’s also imperative to have excellent knife skills. It may seem unnecessary to learn the correct way to slice an onion, but there is a recommended method to it. The best method will cut it most efficiently while making sure that your fingers remain in your view. Learning and using these methods are one of the best ways to prevent accidents, next to purchasing products that can enhance your safety. Another cause may surprise you. Dull knives are one of the primary reasons people get hurt while preparing food. Let’s think about this statement. If your knife isn’t sharp, the chances are that you’re putting more force behind it as you use it merely because it’s not cutting anything easily. That means that if you do slip—or the knife does—that there’ll be more power behind its action. That translates into a higher risk of a worse injury than if you had sharpened the knife first. It’ll slice through foods cleanly and efficiently without having to put more of your weight behind it. While it sounds counterintuitive, it makes sense. Cuts and wounds from knives and other sharp instruments are an issue whether you cook at home or in a restaurant. It is one of the top four types of injuries. Often, it’s only an accident or a moment of distraction. However, there’s no reason why you have to worry about it when you can get something between your fingers and the blade to act as a handy shield. Our Best Knife Guards for Elderly review explores the many choices you have along with the pros and cons of each one in our roundup. They’ll give you the much-needed peace of mind in the kitchen about hurting yourself needlessly. Many of these items present a barrier between you and the knife so that it won’t hurt you if it should slip. Some are wearable, while some you just need to hold on to while you’re cutting. Correct usage is imperative to make sure these products are offering this essential benefit. Bear in mind that some will affect your cutting style and the way you use your kitchen tools. It’s crucial to pay close attention to your work the first times you use them until it becomes familiar to you. We suggest several measures to make food preparation more efficient and safer. First, take a cue from professional chefs and practice mise en place. That means setting up your ingredients before you start cooking. Go through the process of cutting each one as necessary and placing them in a separate bowl in the order that you’ll use them. It will speed things up while reducing the risk of injury that can occur if you handle your knife when your hands are wet or greasy from handling food. It also is an excellent way to reduce the chances of foodborne illnesses when you follow the recommended best practices. Second, practice your knife skills. Accidents often occur when you don’t handle them correct way we mentioned previously. Cutting your food more efficiently will also help reduce food waste, which can help you make the most of your groceries and save money. Third, make sure that your meal prep area is clean and dry. If you’re cutting up round or unstable food like squash, you can stabilize it with a kitchen towel before you make that first cut. Finally, learn how to sharpen your knife and maintain it regularly. We also recommend getting it done professionally every six months, depending on how you often you cook. Many supermarkets and butchers offer it as a courtesy service for customers. Food and cooking are great parts of life to enjoy without the worry of an injury. Knife guards in their various forms offer an excellent way to keep you safe so that you can focus on the task at hand. Our roundup provides several options with different ways to tackle this age-old problem. If one doesn’t work, you have plenty of other choices that can meet your needs. To make sure you’re using the product that’s right for you, make sure it’s comfortable while you’re using it. Some may take some getting used to, but if you ultimately feel it’s only making your cooking more difficult, opt for a different version. At the end of the day, these products should make you feel more secure in your cooking despite arthritis, hand tremors or weak fingers. They should help you cook as you always have and enjoy the meal you’ve created.